In the crock of a 4 to 5 quart slow cooker, combine the broth, onion, garlic, cumin, oregano, bullion cubes, and ranch dressing powder. Add the chicken breasts to the broth, cover, and cook on low for 4 to 6 hours. Remove the chicken from the slow cooker and shred the meat. Return the shredded meat to the slow cooker and add the drained beans, chilies, and corn. Add salt and pepper to taste. 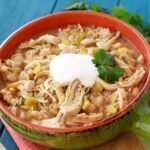 Return the lid to the slow cooker and cook for about 30 minutes or until the chicken, beans, and corn are heated through. Serve with a dollop of fresh sour cream and fresh cilantro.